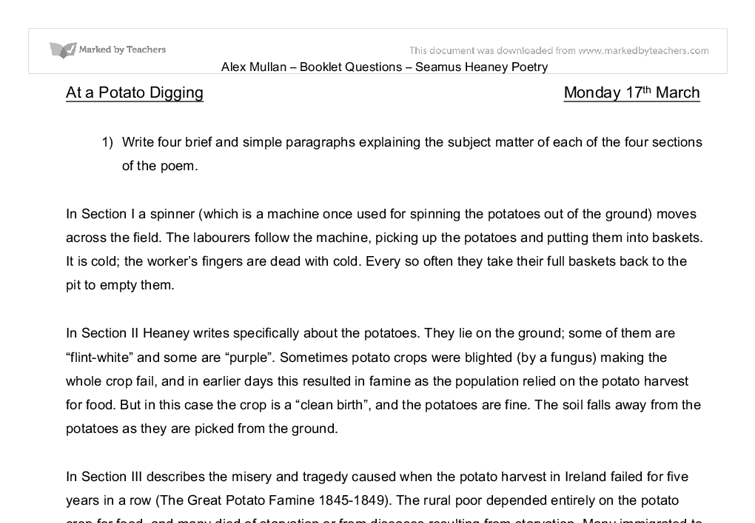 At a Potato Digging Monday 17th March 1) Write four brief and simple paragraphs explaining the subject matter of each of the four sections of the poem. In Section I a spinner (which is a machine once used for spinning the potatoes out of the ground) moves across the field. The labourers follow the machine, picking up the potatoes and putting them into baskets. It is cold; the worker's fingers are dead with cold. Every so often they take their full baskets back to the pit to empty them. 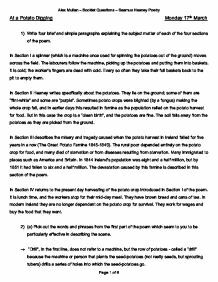 In Section II Heaney writes specifically about the potatoes. They lie on the ground; some of them are "flint-white" and some are "purple". Sometimes potato crops were blighted (by a fungus) making the whole crop fail, and in earlier days this resulted in famine as the population relied on the potato harvest for food. But in this case the crop is a "clean birth", and the potatoes are fine. The soil falls away from the potatoes as they are picked from the ground. In Section III describes the misery and tragedy caused when the potato harvest in Ireland failed for five years in a row (The Great Potato Famine 1845-1849). The rural poor depended entirely on the potato crop for food, and many died of starvation or from diseases resulting from starvation. Many immigrated to places such as America and Britain. ...read more. and Scots may think of 1745 (the Jacobite uprising under Bonnie Prince Charlie). The omission of the first two digits also suggests the viewpoint of the people at the time who do not need to identify the century. By using the same form, Heaney suggests the way the memory has been passed on and kept alive in the oral tradition. 6) The rhythm of the poetry changes in Section III of the poem. What effect does this have? Section III returns to a more regular rhythm; it has an almost jaunty rhythm, quite song-like, which helps to emphasise the grotesque imagery of the dancing skeletons. This initially seems incongruous because it does not fit in with the idea of death, but then it occurs to the reader that it is symbolic as the skeletons are being stripped of their dignity. 7) Write a paragraph explaining what happens in Section IV of the poem. The final section brings us back to the present day. Heaney observes the people stop work for lunch. They are exhausted from their hard work and eat happily 'thankfully breaking their timeless fasts' as if they are eating after a period of fasting (something Catholics do during Lent, building up to Easter). 8) How are the workers in Section IV of the poem described? What is their working life like? In the fourth and final section, the workers take their lunch break - they no longer depend on the potato for their own food (though they earn their pay by digging it). ...read more. 13) Write as fully as you can about the parts of the poem which seems to you to be the most powerful. I thought the most powerful part of the poem was section III because it tells the reader about the people who died in Ireland during the Potato Famine. The way that Heaney describes it so vividly makes it seem horrific and callous. There is repetition of 'live skulls, blind eyed' at the start of this section to link back to the second, but the link is now that these are 'balanced on wild higgledy skeletons', real people who lived in 1845, when the huge potato famine hit Ireland, killing a vast number of people. The skeletons almost seem unreal, not human, as they have all the life taken from them as they 'scoured the land' looking for food, eating the 'blighted' (diseased) potatoes and dying, as a result of this. Also, the people are described in stanza three as desperate and lifeless 'eyes died hard', showing a lifelessness in people's eyes and 'faces chilled to a plucked bird' using a metaphor to make human faces seem pale and withered, as a bird looks when plucked of all its feathers. I thought this was similar to something that would be seen in a horror film, but as there is no visual image available when you read the poem, it is more frightening because the reader begins to imagine the idea in their heads. ?? ?? ?? ?? Alex Mullan - Booklet Questions - Seamus Heaney Poetry Page 1 of 6 ...read more. This poem is full of admiration for the earth, with which his father and grand-father worked so well with. In the poem, 'At a Potato Digging', Heaney is telling us more about the earth, giving 'pebbles' and 'stones' for potatoes. Each row of the triangle tells you the co-efficients for a binomial expansion. Examples 1 2 3 4 Pascal's triangle, then, makes it easy to perform binomial expansions, allowing you to just write the terms straight down without any of the awkward bracket multiplications.